In 100 aphoristic statements, his manifesto exposes how forces for human connection have turned into ones of isolation and repression: money, for example, has transformed from a means of exchange to a means of exploitation, and education has become an extension of occupational training. Digital-age technologies have only amplified these trends, presenting the greatest challenges yet to our collective autonomy: robots taking our jobs, algorithms directing our attention, and social media undermining our democracy. But all is not lost. 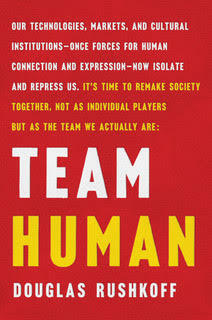 It’s time for Team Human to take a stand, regenerate the social bonds that define us and, together, make a positive impact on this earth.